Who doesn't want to drop pounds the most efficient way possible? Healthy chef and trainer Katy Clark recommends this test: "Whatever weight you're bearing — if you're doing five pounds, if you're doing 10 pounds — if you're not tired by [rep] number 10, then you need to go a little bit heavier. If you are consistently doing that, you're going to see changes in your strength and in your muscle mass." More muscle mass equals more metabolism, so maximize your body's fat-burning potential by challenging your muscles with heavier weights. 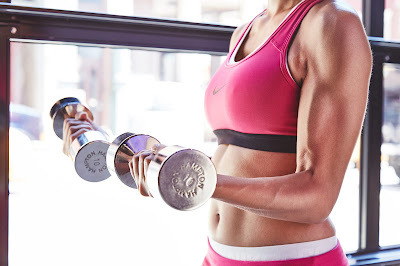 Cardio may help you shed excess pounds, but it's the weights that will help you sculpt the strong, toned look you're going for. "You're not going to change the shape of your body [with cardio], you're just going to be exactly like you are but you'll be a smaller version," says trainer Tia Falcone, who helped Miss America 2013 lose over 50 pounds. "All your flaws will be the same, everything will just be smaller." She recommends doing four weight-training routines a week to sculpt and reshape your problem areas. Of course, if you're not used to a weight-training routine, start small and work your way up to heavier weights; starting too heavy can lead to injuries that can sideline all your weight-loss efforts.